East, West, home's best? As our panel of housing hotshots debates, if you're talking about West of the canal, it depends entirely on what you're looking for. The panelists (from left): Chris Foglia, Bruce Nagel, Marcia Altman, Walter Hoefer, Jim Saladino and Fred Seifert. The Rubicon it’s not, but the Shinnecock Canal still leaves Hamptonites divided. 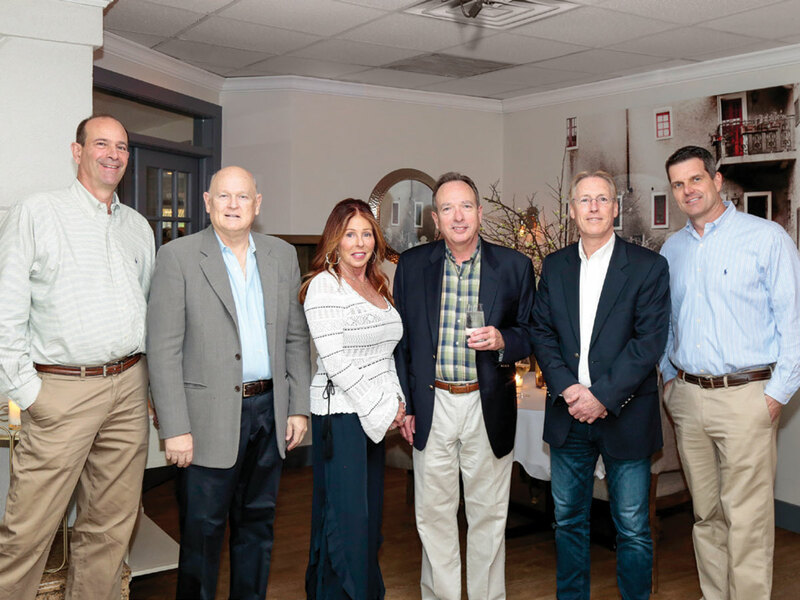 This week’s roundtable participants—architect Bruce Nagel, builder Fred Seifert, energy expert Walter Hoefer and real estate pros Marcia Altman, Christopher Foglia and Jim Saladino—give us the 411 on all things west. Let's define West of the canal. MARCIA ALTMAN: Many buyers in this area—Westhampton, Quogue, East Quogue, Hampton Bays—work slightly west and can live here year-round. Others find the weekend commute much easier, rather than getting on one-lane Route 27. And prices are lower. That’s changing, but it’ll take a long time to equalize. JIM SALADINO: It has picked up tremendously. West of the canal attracts buyers looking for accessibility and quiet nightlife. We’re more family-oriented. Prices here are half, maybe less, but we get the same ocean, the same sand. BRUCE NAGEL: When I was in East Hampton, I never did a project in Westhampton. Now that I’m in Westhampton, I do projects in East Hampton, Amagansett, Montauk; everybody’s traveling past me. West of the canal is much more affordable, leaving homeowners more funds for construction. And Westhampton airport is a good destination. FRED SEIFERT: The North Fork is similar. We also have more people looking for quiet nightlife, nice restaurants. Buyers tell me they looked for years east of the canal and couldn’t find what they wanted. CHRISTOPHER FOGLIA: There’s also accessibility to the beach. Ours is the only area where people on the bay side can walk to the ocean. And we access multiple beaches. Mostly it’s an hour and a half to get here from Manhattan. There’s multiple ways in and out. BN: There’s two great Hamptons villages: Sag Harbor and Westhampton, places you can have some semblance of nightlife, walk the streets, see your friends. In Southampton or East Hampton, you’d be the only person walking. JS: You see that transition in Hampton Bays. They’re not $10, $12, $15 million, but they’re coming up. And it used to be a party town. The bars had all the places kids came to. They’re gone. They all went to Montauk. MA: Quogue is most desirable and claims higher prices. It has an aura of old, established families and is quiet and elegant. It’s the only place in the Hamptons where you can clear your entire property, so it makes owners feel like they have a bigger parcel. CF: Remsenburg is great. It’s quiet; you hear the ocean at night. It’s a low tax base. More people are looking at it. There’s a lot of waterfront; people are coming back because they want water. Out East, it’s unattainable. JS: Montauk is the only place with more beach accessibility. 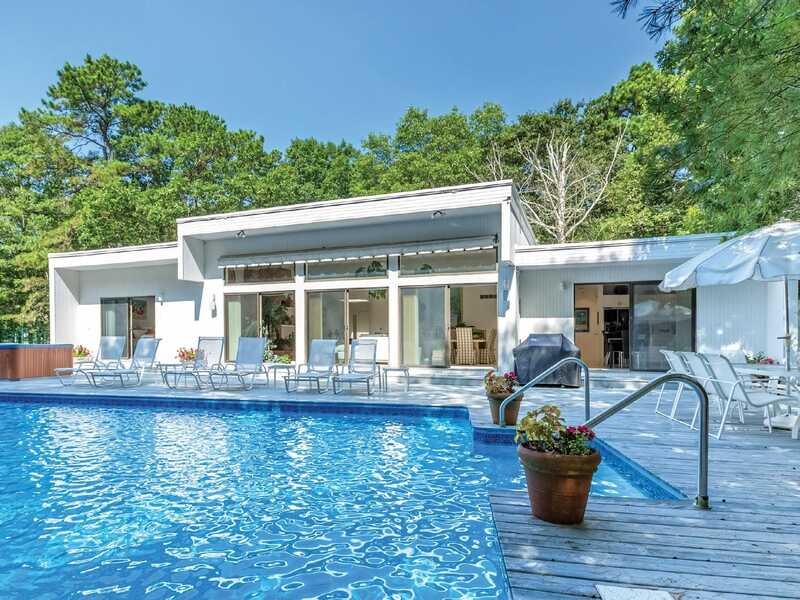 A contemporary home in Quogue listed by Jim Saladino that closed for $1.12 million. What's up from the power perspective? Talk about where you're building. FS: We did a project with Bruce in Remsenburg, right on the water, a beautiful area. We did one in Quogue. These towns have so many things going for them, but it’s trying to get people past the name recognition. CF: Remsenburg, no one even knows where it is. FS: Orient and Greenport are hot. You have to be the right person for Orient, because when you get out there… it’s out there. It’s beautiful, but very country. 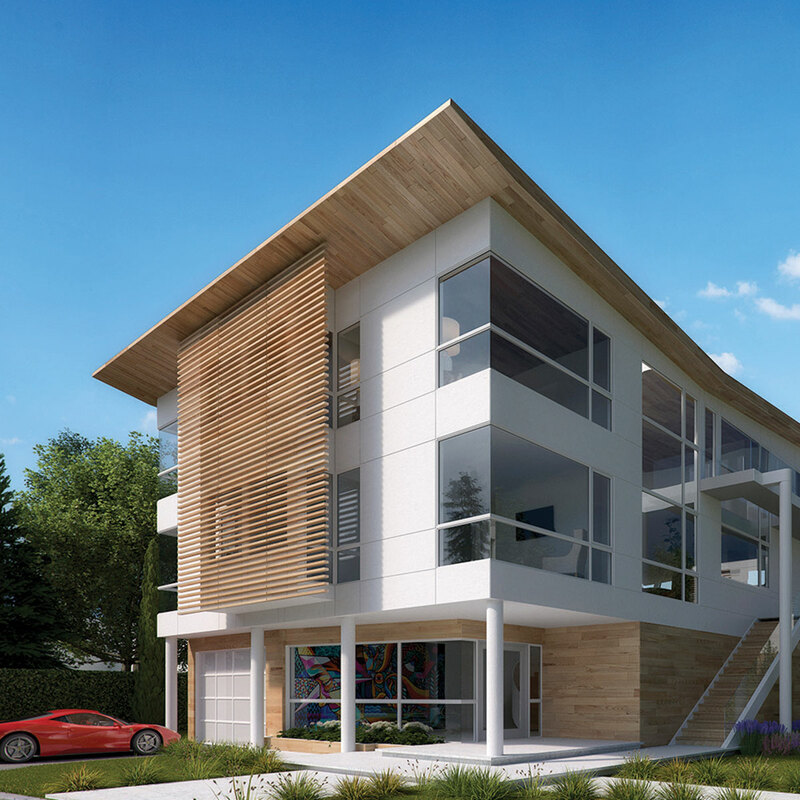 Rendering of a Bruce Nagel home to be built on the beach in Westhampton starting next month. How about architecture out West? 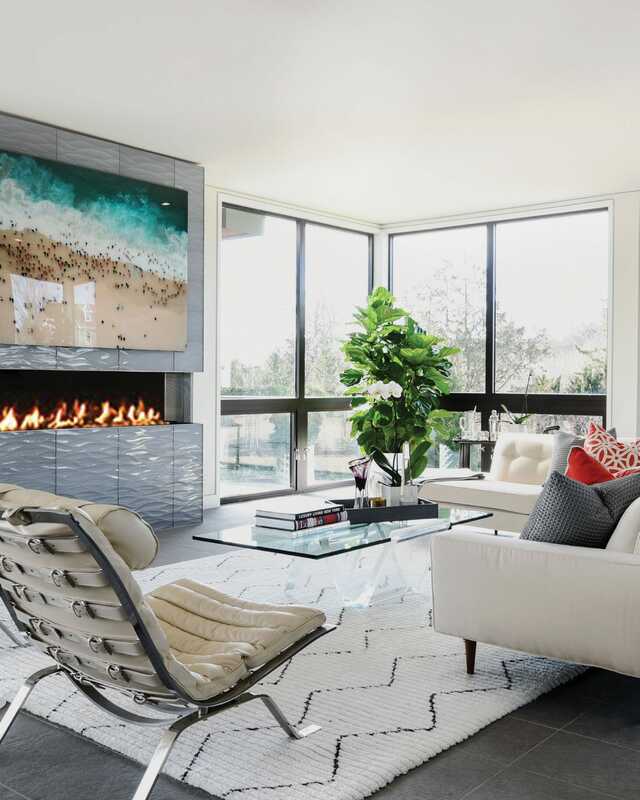 BN: There’s a trend everywhere for contemporary glass-walled structures, but we have a strong history of shingle homes. It’s a balance. FS: In our first 15 years, we never did modern. In the last seven, we’ve done probably 10. But it’s expensive. You think it’s easier and cheaper, but the steel, glass and no trim around windows make it harder. Are people from the West going East, or vice versa? MA: People buy where their friends are. Sellers are seeing great profits on eastern homes they bought decades ago, taking those profits and coming in this direction—getting the same beautiful situation for a lot less. JS: Baby boomers rented west of the canal when they were young. As they made money, they gravitated east. They’re coming back. BN: West of the canal is the future. Places like East Hampton are basically going to die. The traffic is killing them. There was a time when people had to go to Newport. Today it’s like a ghost town. It had the richest people, the biggest houses—it just died. FS: Saturation will force people to move west and to the North Fork. MA: Western high-end areas have no land left; there’ll be more tear-downs. CF: West of the canal will prove to be the best part of out here. Elegant modern details enhance this property listed by Marcia Altman.